Win or “lose,” participation in the Washington County Business Challenge can take a local business to new heights. In 2017, the one-man shop Appalachian Drafting LLC won the Washington County Business Challenge, earning founder Steven Harris $5,000, a year’s membership in the Washington County Chamber of Commerce, and half-priced rent in the Virginia Highlands Small Business Incubator. Now in its sixth year, the Challenge runs startups and existing businesses through an intensive, six-week mentoring program, culminating in an awards presentation that bestows cash prizes and helping hands to winners. Appalachian Drafting founder Steven K. Harris, at the time, was working out of a spare bedroom in his home in Abingdon, providing a niche form of structural steel drafting for customers in the U.S. and Canada. Like many in southwest Virginia, Harris did not attend college and holds only a high school diploma. He began working at a steel shop at age 17, and had no ambitions of starting his own business. He applied to and committed to the Challenge, learning over those six weeks in early 2017 everything from marketing to finance and the legal side of a business. With the lessons gained from the program, he has hired four employees, each making better-than-average pay and full benefits. He invested the cash winnings into tools and technology to keep his business growing. The company offers 3D Building Information Modeling – known as “BIM” – which allows construction, architectural and engineering professionals to essentially build a structure or building in a virtual environment and identify issues before doing so in the real world. 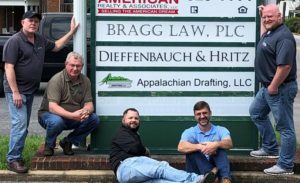 After the Challenge, Harris moved the company out of his home and into the Virginia Highlands Small Business Incubator – as a winner, Appalachian Drafting received half-priced rent. The firm has expanded so much that this summer it moved into a downtown Abingdon office building’s top floor on East Main Street. Harris notes that just because a business doesn’t win an award in the Challenge doesn’t mean they’ve lost anything. In fact, many of the “losers” of the Challenge go on to continue their operations even stronger; of the 92 participants that have gone through the Washington County program, 48 percent of them have started or grown their own businesses. Six businesses have created 57 new jobs. “The awards portion of the Challenge is appreciated of course, but more of a cherry on top of a great opportunity for all who participate,” Harris says. He credits the Challenge with helping his business take the next step – and he credits his family and customers for pushing him to take it. The company does business in all 50 states and has been contacted by companies in other countries. He doesn’t just credit the Challenge and his team though – he believes there is a higher power at work. “It is truly amazing to me to see how the Lord has worked in this company and how blessed we are to be a part of this company and the ride,” he says.